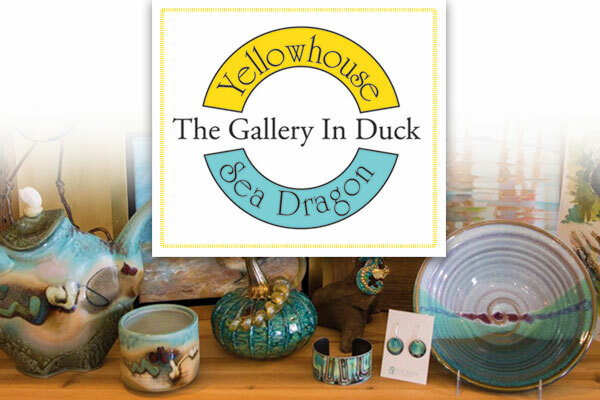 Yellowhouse Gallery, which has had its home in Nags Head since 1969, has moved to Duck and joined its sister gallery, SeaDragon, in the Duck Waterfront Shops beginning in 2018. Yellowhouse will still showcase fine local photography alongside local, regional, and American craft. While many of our artists find their inspiration in the seashore, their expressions and chosen media vary. We showcase the largest collection of Outer Banks photography in the region. In addition to gallery owner Eve Turek’s photography, we represent an extensive collection of Ray Matthews’ photography. Staff member Phyllis Kroetsch's work rounds out the photography offerings. We also have feature artisan jewelry including sea glass; stained glass; textiles; pottery; and wood. We have Outer Banks maps and a small collection of genuine antique charts and prints of the local area as well as some antique bird prints and antique botanicals. Yellowhouse celebrates its 50th year in 2019! SeaDragon Gallery continues its long tradition of bringing the finest in American craft to Duck, along with a few Fair Trade Federation items. You'll find local art and locally carved birds as well as artisan jewelry, pottery (much from our region), art glass, and works in fiber and metal. Our offerings range from traditional to contemporary, along with a few specially chosen items guaranteed to bring a smile or a laugh! In both shops, you'll find a wealth of knowledge about the artists we represent and their chosen mediums. You will leave with treasures you won't find elsewhere. Come see what we have selected for you this season! Looking for that perfect Outer Banks artwork for your beach-themed room or your beach house? The Gallery in Duck showcases scenics of the Outer Banks in award-winning original photographs. Artisan jewelry, pottery, textiles, OBX maps, antique coastal charts, some local art and more. Spring and Fall, Mon - Sat 11-5; Sunday 12-5; Summer Mon-Fri 10-9; Sat 10-7; Sun 11-5.